2010 was upside volume node for SP – resistance for short squeeze rally, and 120 minute EMA! Picture tells 1000 words……short squeeze rallies are sharp and swift and leave a vacuum when they stop. Look where resistance came in – price still remains in a downtrend channel as well. Play today was for the three pushes down on Dow 30 minute to lead to reaction/consolidation to fill out 120 minute charts. 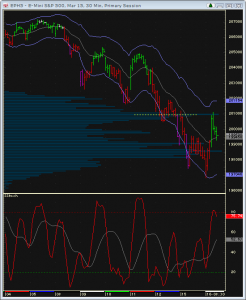 all indexes found solid resistance at 120 minute EMA.